The Panasonic Lumix DMC-LZ30 is a digital compact camera with a powerful 35x optical zoom, giving a stunning range of 25-875mm. It also features a 16 megapixel sensor, Manual shooting mode, 3 inch LCD screen, HD video and 10 digital filter effects. It's a large zoom camera that will appeal to the happy snapper crowd as well as keen amateurs, thanks to some manual functions. But will the image quality stand up in our test? 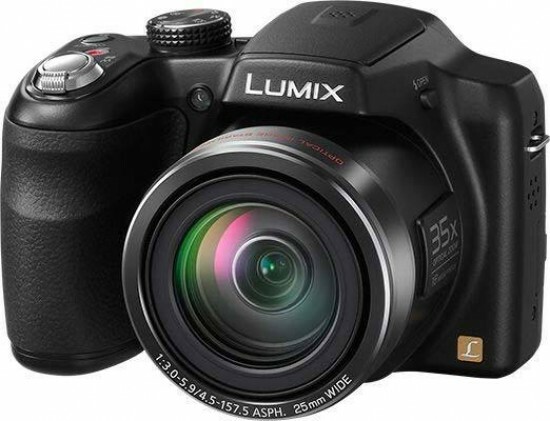 Priced at around £158.99, the Panasonic Lumix DMC-LZ30 is available in black or red. From the outside, the Panasonic Lumix DMC-LZ30 looks like any other bridge camera on the market today. Take for example the simplified command dial with only eight modes on it. There's no provision for shutter or aperture priority. The LZ30 also lacks an Electronic Viewfinder (EVF) so you can't use it as a normal camera by holding it up to your eye. The main issue that this has is when holding the camera out to watch the screen, it moves out of your centre of gravity and becomes harder to keep still. The result of this – especially as you zoom out – is that the camera has to overcompensate by using the image stabiliser or if that's not enough, ramping up the ISO. For such a large camera, the controls are smaller, like what you'd find on a normal digital compact. Everything is arranged in a typical fashion with the command dial sat on the right shoulder next to the pop-up flash. The power buttons sits next to it with the direct video record button between that and the shutter release button. On the back, there's a simplified layout of the quick access buttons with the Exposure button (which we'll cover later) at the top, the Playback button just below and the navigation pad as the focus point for the area. The pad doubles up its commands so you can access other features, such as flash, macro, self-timer and exposure compensation. The metal tripod bush and locking battery door – while small – are indications of a better build quality. The Panasonic Lumix DMC-LZ30 certainly doesn't feel light and the extra weight gives it an air of a superior build. However, Panasonic have not even fitted the Mega OIS to the lens. A name that's been synonymous with high zoom Panasonics for years. The camera is well balanced when the batteries are in, which are 4x AA type. Panasonic have positioned the LZ30 just above the beginner market which is why there's a Manual mode on the command dial. The manual mode is pretty basic though. It only has two aperture values - which will vary depending on the focal length of the lens, but there will be one wide and one narrow. There's more variation on the shutter speed which is great for creative shots involving longer exposures. To operate the manual control, you have to put the camera to the M position on the command dial and then press the Exposure button on the back. The aperture and shutter speed on the screen will then highlight with arrows indicating which way you can increase or decrease the current values. Then it's a case of using the pad on the back to adjust them. The Panasonic Lumix DMC-LZ30 has a start up time from cold of around 1.7sec which is a pretty good performance on the average of 2.5sec. There are two drive modes on the LZ30. A burst mode and continuous shooting mode. In the continuous mode, the LZ30 takes seven photographs in a ten second period. That works out at 0.7fps (frames per second). It plods along pretty respectfully and should do that until the card is full. The burst mode knocks the resolution down to 3 megapixels. It takes six images in the first two seconds before slowing to 1fps. It takes up to 14 seconds to get the rest of the information on to the memory card before it's ready to record again although this could be shorter with a faster card. Using the menu system is pretty easy. The Q.Menu simplifies access to the main processes that you'll use in everyday shooting, such as resolution, ISO, white-balance and drive modes. In the Main menu, there are three sections to choose from; Rec, Motion picture and Setup. The Rec section extends what the Q.Menu offers focusing or metering modes then the Rec section is what you need to choose. There's four pages of options and certain modes will blank out if they're not accessible in the mode you've selected. The Motion picture option is for video modes and there's only two for the recording quality and the focus modes. Finally the Setup menu is for the more core features of the camera such as the language settings, date & time, card formatting and monitor settings. You can view pictures on the Panasonic Lumix DMC-LZ30 regardless of whether the camera is switched on or not. When the camera is on, simply press the Playback button on the back of the camera above the direction pad. If the camera is off, simply press the button and hold it down for a few seconds to get the camera to fire up. Images will be full screen and you can scroll through them by using the left/right buttons on the back of the camera. You can zoom in to the pictures by using the zoom switch and if you zoom the other way, the pictures zoom out into a thumbnail gallery. You can do this three times with the final option bringing up a calendar of dates you took certain photographs on the card. You will notice on the pictures, if you press up on the navigation pad, you can access the Creative Retouch menu. In this menu, you can add various effects to the photographs, such as Retro, High key and Low key, Sepia and various HDR effects. The Panasonic Lumix DMC-LZ30 has an HDR mode which will blend multiple images to create a neutrally exposed image with detail in the shadows and no burn out in the highlights. The process takes three pictures in quick succession; one over exposed, one perfectly and one under exposed. It then blends them together in camera. The pictures are taken at 3 megapixel – which is a real shame – and we hoped that it may blend them to create a larger resolution image, but it doesn't. In the box, you get the camera and a set of AA batteries to get you started. A small bag on the top layer contains a basic starter guide in multiple languages, the usual European warranty information and a software CD that contains the full User Manual as well as PHOTOfunSTUDIO 9.0 which is an editing program. There's also a trial version of LoiLoScope for editing videos.